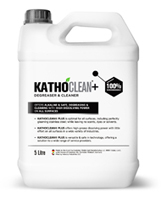 KATHOCLEAN+® is a multi-surface, low-streak cleaner & degreaser providing excellent hydrotropic power to cover all cleaning challenges, significantly outperforming glucoside, octyl amphoteric and coco amphoteric “high performers” at a lower use level. KATHOCLEAN+® provides a number of additional benefits, including: anti-fogging on glass, easier next-time cleaning of certain surfaces, easy rinsing, effective soil repellency on glass and ceramic surfaces, performance stability over a wide pH range, and ease of formulation. KATHOCLEAN+® applications can cover kitchen cleaning (stainless steel surfaces, ceramic tiles, glass tiles, kitchen tops); bathroom cleaning (shower cabins and mirrors); all-purpose and glass cleaning (floors; ceramics; windows, hard, shiny surfaces; metal surfaces); car and marine cleaning (windshields, coatings); and mirror, window and glass-ceramics cleaning in all setups and vehicles.